Introduction: Achyranthes is a well-known herb used in folk lore and traditional systems of medicine for its therapeutic value. The two species Achyranthes aspera and Achyranthes bidentata are used interchangeably by people and by herbal industries due to their resemblance in appearance. Therefore, the present study was undertaken to evaluate the comparative pharmacognostic and pharmacological properties of both species. Methods: Pharmacognostic characters were evaluated as per the guidelines of Ayurvedic Pharmacopoeia of India. A quantitative HPTLC method was developed for quantification of linoleic acid and oleanolic acid using toluene: ethyl acetate: formic acid (6: 4: 0.5 v/v/v) as a mobile phase. Quantification was performed using linear regression analysis by plotting the peak area vs concentration curve with 2000-5000 ng/band (R2 = 0.998) for oleanolic acid and 2000-5000 ng/band (R2 = 0.994) for linoleic acid. The developed method was validated in terms of accuracy, recovery and inter and intraday study as per ICH guidelines. 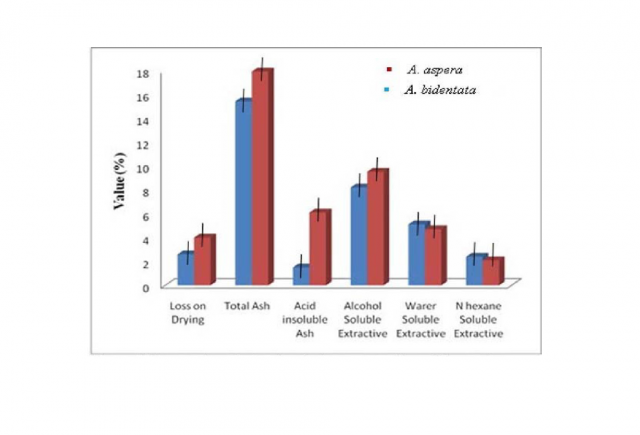 Antioxidant activity of methanolic extracts was estimated by five different models viz. DPPH free radical scavenging assay, total anti-oxidant capacity, reducing power assay, total flavonoid and phenol content. Anti-diabetic activity was analyzed by α-amylase inhibition assay using 3, 5 di nitro salicylic acid and iodine starch model. Results: The limit of detection (LOD) and limit of quantification (LOQ) of oleanolic acid and linoleic acid were determined, respectively, as 0.426, 1.29 and 0.427, 1.29 μg mL−1. Inhibition of free radicals increases with concentration and IC50 of A. aspera and A. bidendata was obtained at 1.35 ± 0.173 mg/ml and 1.28 ± 0.169 mg/ml respectively. In in vitro antidiabetic activity, IC50 value shows that A. bidentata exhibit better activity than A. aspera. Conclusion: The present study generates data for the proper establishment of quality control standards of the crude drug. Shukla PK, Misra A, Srivastava S. Comparative Pharmacognostical and Pharmacological Evaluation of two Achyranthes species. Pharmacog Journal. 2018;10(2):309-314.